Not your average (boring!) book on economic development, this is an inspired account of a revolutionary approach to revitalizing urban and rural economies, one person at a time. Through "Enterprise Facilitation," depressed communities can build lasting hope and prosperity by first helping individuals recognize their talents and their business passion, and then provide the skills necessary to transform their dreams into meaningful and rewarding work. Ernesto Sirolli is the recipient of the Silver Jubilee Award for the Best Job Creating Project in Australia. He has six years experience working for local self-reliance in African countries and twelve years implementing Enterprise Facilitation programs in the US and other countries. He lives in St Paul, Minnesota. 5.0 out of 5 starsIf you're curious about entrepreneurship and its affect on the world, I would point you towards this book. Saw this man on a TED Talk video in Christ's Church New Zealand. He's changed my life and has given me a moral justification for - and an inspiration towards - the pursuit of entrepreneurship in my future. This is the history of his development of Enterprise Facilitation, which led to his other book: How to Start a Business and Ignite Your Life. I ended up buying that one too. As well, if you've ever learned something to more than an amateur degree, you realize that there are major categories that you can use to make learning easier. For instance, I study chemistry, so we categorize material into Inorganic Chemistry, Organic Chemistry, Physical, Analytical, Polymer and so forth. He does the same. He breaks all forms of entrepreneurship into 3 major areas: Make it, Sell it, and Look after the Money. Obviously, there's quite a bit of in depth information in each area, but those categories make learning it easier. It's all done through the form of story telling, which not only demonstrates a real-life use of his technique, but it keeps it interesting for those of us with short attention spans. I definitely recommend it to those interested in entrepreneurship, and you should also look up the video: Want to Help Someone -- Shut Up and Listen! There's the link. The most inspirational 17 minutes of my life. He's a master story-teller in my eyes, and the accent makes it perfect. I ended up reading the entire book while imagining him telling me the story in his Italian accent. I bought "Ripples from the Zambezi" thinking, okay, person-centered development from an Italian who did government-sponsored work in Africa, perfected his methods in remote western Australia, and now spreads his gospel in the United States. Ought to be an interesting read and a good 'little' story. 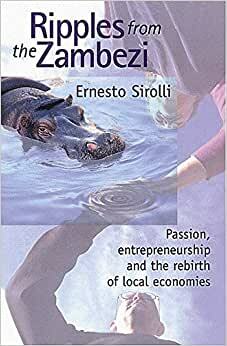 This is - in my estimation - a great book by a true visionary, Ernesto Sirolli. The two chapters in the middle of this book "The Esperance Experience" and "The Esperance Model Applied" are as good as business-writing gets. In Sirolli's world, the glass is neither half empty nor half full. Rather, the water is gushing over the top of the cup. The stories he tells here of enterprises 'facilitated' in the bleakest economic conditions imaginable...well, it can't help but turn you into an optimist. But Sirolli goes further. He takes these experiences and imagines them on a grand scale where, as he says, "reciprocity matters." Calling it a "civic economy," he envisions a world benfiting from "generalized reciprocity, from people helping people to succeed, with the understanding that well-being of the community is to everybody's advantage." Don't misinterpret these sentiments. Sirolli is a capitalist at heart, but he presses for a system "beyind capitalism...which enhances participation in the creation of wealth, not only in its accumulation." How does he connect the dots from tiny Esperance to his grand vision for a civic economy? I urge you to read "Ripples from the Zambezi" to find out. 4.0 out of 5 starsBook published by progressives champions free enterprise! Sirolli quotes Tom Peters (! ): " The market is frightening, even terrifying. It's not pretty. It's surely irrational, yet over the long haul, the unfettered market works for the most rational of reasons; it produces more experiments, more tries, more wins, more losses, more information processes (market signals) faster than any alternative." This is the system Sirolli champions. In the Foreword to this book, Mark Roseland, direector of the Community Economic Development Centre at Simon Fraser University (Vancouver, BC) describes New Society Publishers as evolving out of concerns about "peacemaking, nonviolence and feminism, later broadening to cover alternative economics, progressive leadership, and educational and parenting titles concerned with raiseding peaceful children." This may be the first and last volume that both Libertarians and Progressives will read and say: "Wow, what a great book!" Part of the miracle may be that Sirolli, an Italian, began his career in development in Africa (disastrously) and Australia (successfully), coming to the U.S. later. Sirolli, unlike most people on the left, is not an elitist. One chapter bears the subtitle "If people don't want to be helped, leave them alone." While Sirolli would go to government organizations looking for bucks to help an entrepreneur off the ground, he states (p. 24) "Contrary to Dante's 'Inferno,' ... my hell wasn't populated by naked gluttons, greedy merchants, and assorted petty sinners. The torturers ... were well-dressed authoritarian figures who, in the name of an idea, would torture and beat the psychological life out of the people in their power. From unyielding bureaucrats to religious fanatics, from political extremists to rabid do-gooders, my demonology started to contain anybody who dreamt up a code of conduct and tried to manipulate or coerce others to follow it." Sirolli is well-read. He explores the thoughts of Carl Rogers and Abraham Maslow and A.S. Neill (of Summerhill fame), quotes Peter Drucker (not to mention Confucius, Kahlil Gibran and Goethe!). Robert D. Putnam (Bowling Alone) even gets a mention. But Sirolli is basically a practical man of action trying to help individual entrepreneurs turn their dreams into businesses. This book is about his decent, caring efforts to facilitate grass-roots entrepreneurial capitalists succeed. It is a fascinating and heartening work!